Highlight your love of gardening in a whimsical way with the Ancient Graffiti Watering Can Rain Chain. For centuries, rain chains have been used to direct water away from the sides of buildings, and this piece will certainly accomplish this while bringing a bold look to your home. 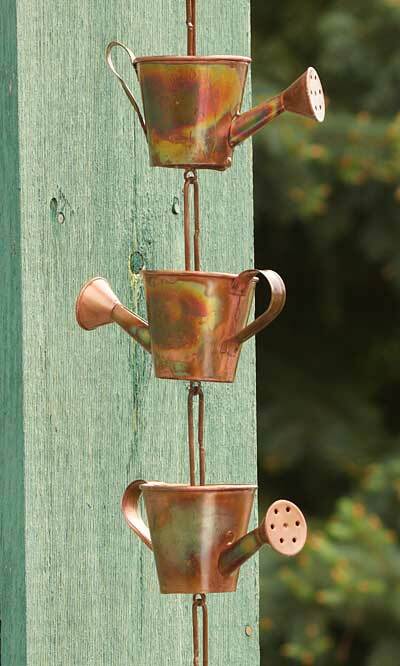 Miniature watering cans create this adorable chain, and their flamed copper colored finish meshes with the outdoors. A generous link connects each can to the next, furthering the chain motif, and these help direct water down the piece for a fantastic look. Place a rain barrel or other container beneath the chain, for saving rainwater for use in the garden. Each of these links and cans may also be removed for a custom size, and the steel construction lasts for seasons of use. An included, steel gutter clip installs securely in the drain hole of your gutter, and supports the chain for a unique home accent. Bring a charming look to your home and help direct rainwater to a basin with this Watering Can Rain Chain.